Senator John McCain (R-AZ) has been the most consistent, potent, and maniacal critic of the Trump administration since Inauguration Day. It’s almost as if McCain would have preferred Hillary Clinton as President of the United States, because he’s refused to offer any support or praise of the Trump administration. On of the targets of McCain’s criticisms appeared on NBC’s Meet the Press Sunday morning to answer the Senator’s concerns and explain why he (Tillerson) was right, and McCain was wrong. Instead of meeting McCain’s rude commentary with similarly uncouth words, Tillerson first praised McCain before laying out a logical argument to support his own position. In just a few short moments Tillerson proves himself to be a far-more capable voice on foreign policy than McCain has been over the last few decades. McCain goes on to write, “With those words, Secretary Tillerson sent a message to oppressed people everywhere, ‘Don’t look to the United States for hope. Our values make us sympathetic to your plight, and when it’s convenient we might officially express that sympathy. '” Some pretty tough words from Senator McCain. What do you say in response? 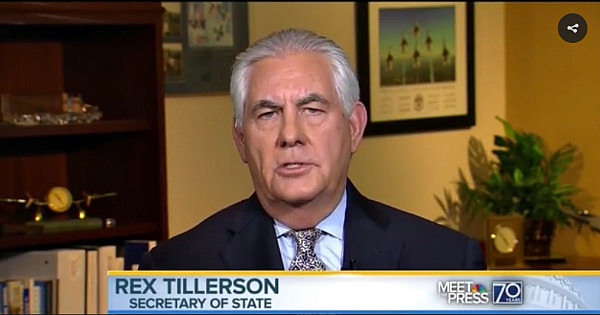 Rex Tillerson: Well, first, I’d say if anyone has earned the right to express their views, Senator McCain has. And I have great respect for the senator. I think the point that I was making, Chuck, in that message to State Department employees is an important one to understand. And that’s that America’s values of freedom, of treatment of people, human dignity, freedom of expression throughout the world, those are our values. Those are enduring values. They are part of everything we do. And in fact they serve as the guidepost and they serve as the boundaries as we develop our foreign policy approaches and our diplomatic efforts. But I make a distinction between values and policy. A policy has to be tailored to the individual situation. To the country. To its circumstances. To the broader issues that we are addressing in terms of advancing our national security interest, our national economic interest. And so policies have to be adaptable. They have to change. They have to adjust to conditions. But our values can never change. Our values can never be put in a position of having to be compromised. And so the values guide our policy, but if we put our values in the front of our policies and say, “This is our policy,” we have no room to adapt to changing circumstances to achieve our ultimate objective. And I think if we are successful in achieving our ultimate diplomatic and national security objectives, we will create the conditions for the advancement of freedom in countries all over the world. Hopefully, McCain was watching the interview and learned a few things about modern foreign policy. It’d be nice if he’d get his head out of the 1970’s and back into this decade.